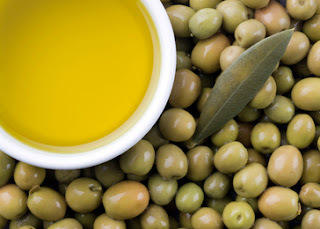 Virgin olive oil is the result of a single, simple pressing, however, cold pressed is a marketing label rather than a processing technique. Extra virgin is the highest quality olive oil - characterized by "perfect flavor and odor, maximum acidity (oleic acid) of 1g/100g. - 1% with maximum peroxide value mequiv 02/kg of 20" In some regions, extra virgin olive oil is judged by a panel of experts for the taste, aroma and mouth feel. This oil tends to be more delicate in flavor, and is preferred for salads or served at the table with bread dipping, or added to soups and stews. Fine virgin olive oil is a little less perfect - with the "maximum acidity (oleic acid) of 2g/100g. - 2% with maximum peroxide value mequiv 02/kg of 20"
Semi-fine or ordinary -- suitable for cooking when subtle flavor is not required. Refined -- maximum acidity of .5g/100g, lacking the flavor of virgin oil. Pure -- a low-cost blend of refined and virgin, such as you might find in large quantities at a discount food warehouse. Pomace refers to the pounded olive residue. 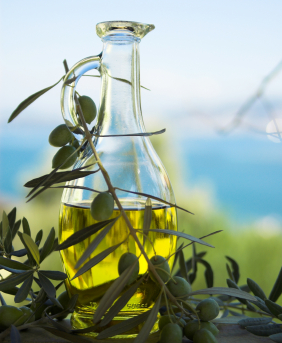 Refined olive-pomace oil and olive-pomace oil are lower-quality oils. Pomace oil, olive cake, and lampante (or lamp grade olive oil) are not intended for human consumption, and are generally used for industrial or technical purposes, such as soap making. Save and Share on Facebook, Twitter .....!